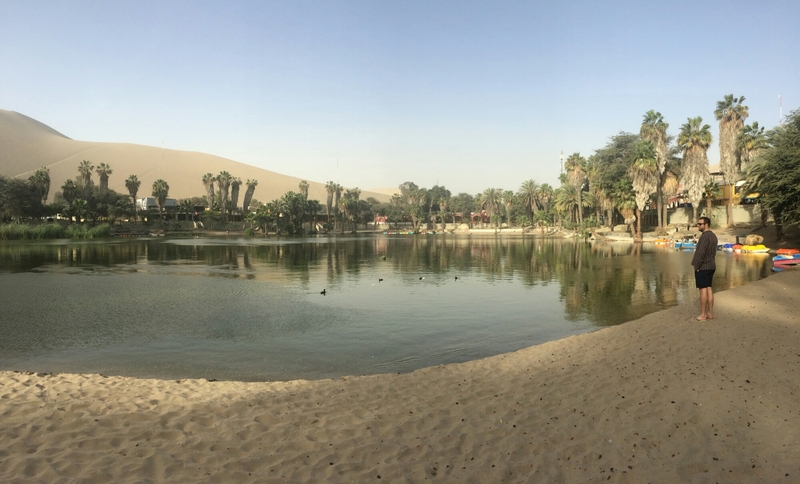 Huacachina – Sand Dunes, Sunshine and… Speeches?! 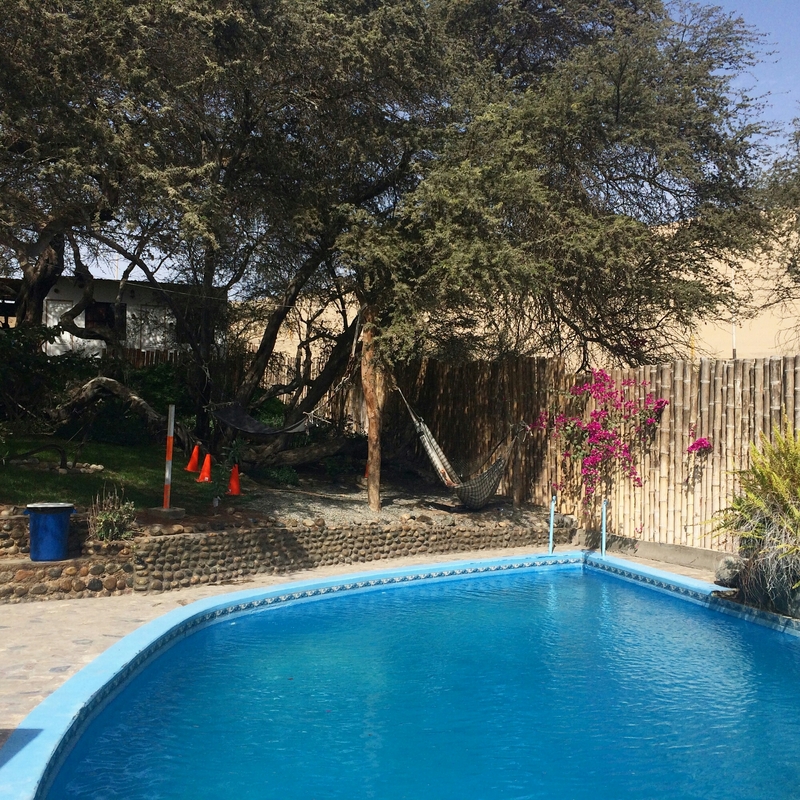 Who would have thought you’d find a desert oasis paradise in the middle of Peru?! After a couple of days in busy Lima, it was so nice to chill out with a cerveza and enjoy the sunshine. We definitely got into holiday mode here! Huacachina is a pretty town and the locals are so friendly and welcoming. On our first night we even made a new best friend – Tequila. No not the drink, but a gorgeous little puppy who found us near the lagoon and basically didn’t leave our sides for the rest of the evening. Unfortunately, Joe didn’t get drunk enough to let me smuggle her into my backpack as a souvenir. To get to Huacachina, we travelled from Lima to Ica with Cruz del Sur, which was a good 4 hour journey – we were really impressed with the Cruz del Sur bus, but will cover that a bit more in a future blog post! When we got to Ica, we took one of the official taxis waiting at the bus station for the 5km journey to the Huacachina oasis. The taxi was cheap, just 10 soles, and it was good to have some peace of mind that we weren’t getting ripped off because it was an official taxi company (we’ve heard a few stories about gringos having trouble with taxis so we’re being a bit wary). We stayed in a great little B&B called Rochabus, which had cute rooms facing on to the garden, a pool (!) and the most comfy hammock. 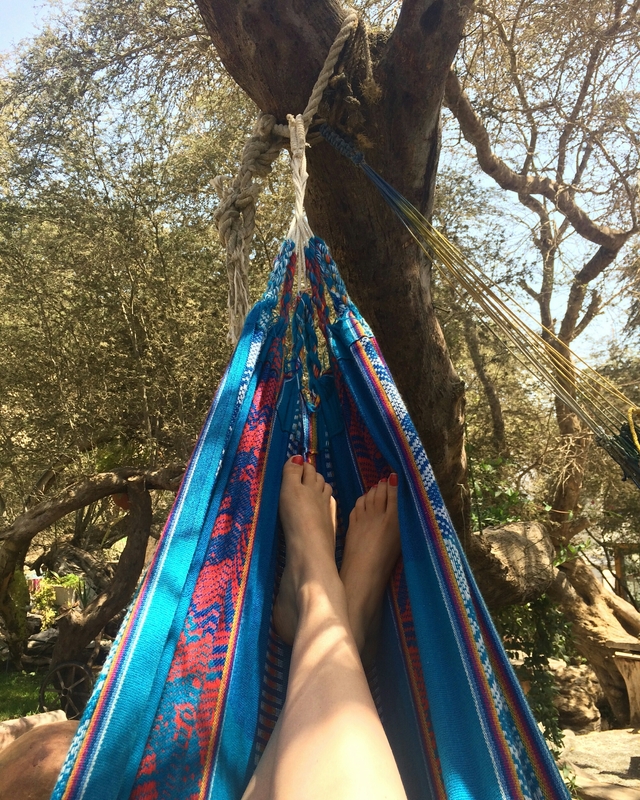 If we weren’t out and about, the hammock in the garden was my favourite spot for a siesta. As you might have guessed, this is basically like snow boarding but on sand (no brainer) and it’s a lot of fun! When we got married, rather than ask for furniture and other bits, we put together a list of activities so that people could contribute to our adventure honeymoon if they wanted. Sand boarding was the first thing off our list we got to do – thank you so much Tom and Bérengère! We booked an afternoon dune buggy and sand boarding tour with the Desert Nights hostel (which also did a great beer and burger deal for 20 soles) for 40 soles each. Most of the hostels offer the same tour so it’s really easy just to wander around and take your pick. First thing is first, the dunes are HUGE! Neither of us have actually been to the desert before so we didn’t really know what to expect, but we definitely felt a bit like we were in Aladdin. Especially once we got of the town and into the desert. A dune buggy ride is the best way to experience the desert and we really enjoyed ours. I had been (warily) expecting that it would be pretty wild – Joe had read that you can “make air” after launching off some of the dunes. However, it was a tad tamer than what I had thought it would be and even I was secretly hoping we could go a bit faster. That was until we got to the sand boarding bit. Any sort of thrill seeking part of me that has started to creep out during the ride, magically disappeared when I saw what we had to board down. I mean, they tried to break us in with an “easy one” but jeezo it was huge. Joe, being a bit braver than me, was the third one up and did it the classic way – lying on his front on the board, arms tucked in, legs wide for stability. Like a pro, he totally nailed it (although he did go over a bit of a bump at the bottom and now has some lovely bruises on his forearms to prove it). My turn – there was a slight moment of “oh my days why am I doing this?” as I peered over the edge, but before I knew it I had been given a push and was flying down the slope. And I totally loved it! Even managed to avoid the bumpy bit (accidental but still) so I walked away unscathed and on a high. So I did it and again, I loved it! Maybe I am a bit of a thrill seeker after all! After the fourth and last dune (not as steep as the third), we sat and watched the sunset, which was a beaut way to end the day. After our sand boarding thrills, the next day we decided to take it easy and have a lazy day. I know, it’s a hard life. Mid morning, I decided to go for a wander (code for ‘buy Joe a birthday souvenir’). Outside the hotel there was a ceremony going on. Official looking people were raising flags and giving speeches in front of the big ‘HUACACHINA’ sign. Partly to see if I could understand and partly because they were blocking the route to the market, I stood and watched for a while. From what I caught, they were talking about how Huacachina is doing a great job with tourism and it’s a clean, safe and beautiful town (which is totally true by the way). After 15 minutes or so the speeches finished and they started to chat among themselves – my cue to cut through to the market. They were all really nice, smiling and saying “hola” to me, but then a guy stopped me and handed me some wine. Before I knew it I was eating sandwiches, drinking Pisco and chatting with the locals. The first guy then asked if I would do an interview. I kind of felt like I couldn’t say no, I mean, I had just got a free lunch from them. Somehow the ‘interview’ was actually in front of the whole crowd – I was called up, handed the microphone and had to speak about my time in Huacachina. In front of all these official people. As surreal as it was, I did love retelling the story to Joe afterwards. Crazy morning!! After my crazy morning and our previous day of sandboarding thrills, we decided we needed a chilled out evening. What better way to do that than hike up a gigantic sand dune?! On the previous afternoons, we’d seen people heading up the big dunes on the north and west sides of the lagoon for sunset. We’d heard the views were amazing and after seeing the sunset at the end of the dune buggy tour, we definitely wanted to give the hike a go. For most of the way up, we pretty much felt we were taking one step forwards and two steps back – the dune was so steep in parts and unless you’re walking along a ridge, you just sink right into the sand. Saying that, it didn’t take us long to get up to the top, just 25 mins of grafting and we were rewarded with the most incredible views. If you’ve got time, we definitely recommend going up the big dune for sunset. Even better, it only takes 5 minutes to run/skid/gallop back down the dune afterwards. All in all we had an amazing few days in this lovely chilled out oasis town. On our last day we celebrated Joe’s 30th with some nice Peruvian food, Pisco sours and more cervezas in a fun restaurant called Huaca-f*****g-china. Have you ever visited Huacachina? Or do you have any crazy travel stories? Leave us a comment below! Follow us on Instagram @pitkinswithpassports for more of our travel photos.